a godsend for marketers in an economy that has crunched advertising budgets." Enterprise Email provides leading edge, 100% permission based, email marketing technology, that empowers businesses and organizations with easy to use e-marketing solutions. We provide the expertise and technology needed to make your email campaign succeed. Our service allows companies to easily integrate their database and information, without the expense of installing and managing email software on their end or requiring extensive IT resources. We offer several advanced email marketing solutions to companies looking to communicate both with their current and potential clients, with employees, with partners, with investors or anyone integral to their business. Acquiring a customer costs 5 to 10 times more than retaining one (eMarketer, 2002). A 5 percent increase in retention yields profit increases of 25 to 100 percent (Bain and Co., 2002). Repeat customers spend, on average, 67 percent more (Bain and Co., 2002). After 10 purchases, a customer has referred up to seven people (Bain and Co., 2002). Twenty percent of customers account for 80 percent of total revenues. E-mail marketing can be as simple as informing an existing client base about an upcoming promotion, event, news or sale on items in their areas of interest, or it could be as complex as tracking customers’ preferences from their online and in-store credit card purchases, and then targeting the message, according to their previous buying habits. Either way, customers appreciate the personal service this type of campaign provides and are more likely to remain loyal to your company. Click each step for a better technical understanding of how email marketing works. 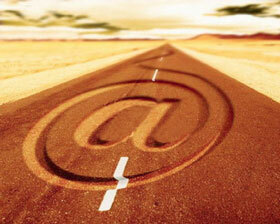 Email enterprise@jegraphic.com or call us at 718 494.0544 x 11 to discuss your email marketing needs.